With an opus of more than 200 compositions, Josef Gabriel Rheinberger made a significant contribution to church music in the second half of the 19th century. 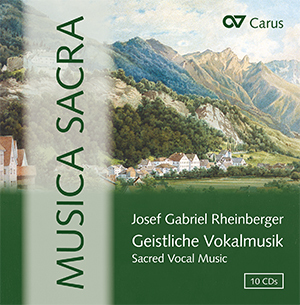 Since the beginning of the Rheinberger Complete Edition at Carus, the printed music has been accompanied by a Rheinberger CD series (known as the "Musica sacra" Series). In 1988 "Der Stern von Bethlehem" op. 164 appeared not only as the first volume of the Rheinberger Complete Edition, but at the same time was also released on CD. And just one year later Frieder Bernius and the Kammerchor Stuttgart won a German Record critics music prize for their interpretation of Cantus Missae op. 109, Abendlied op. 69,3 and other motets. The "Musica sacra" Series with many world premiere recordings is now available as a box set of 10 CDs. Renowned soloists and ensembles attest to these outstanding interpretations.